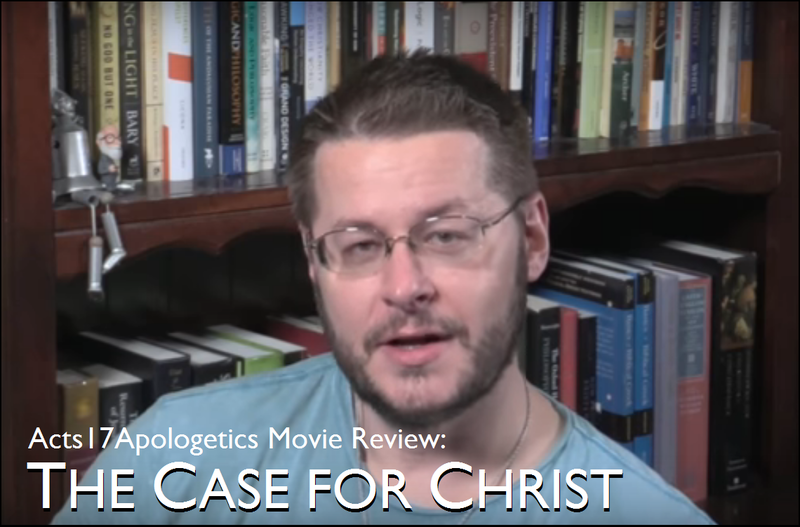 A recent movie called The Case for Christ depicted the testimony of Lee Strobel, an investigative reporter who starts out the movie as an atheist but ends up convinced that Christianity is true after he conducts an investigation into the evidence for the resurrection of Christ. I enjoyed the movie and recommend it for adults; those interested may benefit from David Wood’s review. Here, I want to focus on one particular point in the movie that seems capable of improvement: the treatment of New Testament manuscript evidence. More than once in the movie, the existence of 5,843 Greek New Testament manuscripts is emphasized. Since this is a much greater number of manuscripts than what we have for any other ancient composition, Strobel accepts this (in the movie, and in the identically titled book) as evidence of the reliability of the New Testament text. There is a high risk that this is going to give many audience-members and readers a false impression – one that is liable to be taken advantage of by aggressive anti-Christian writers. To acquire a more focused picture of the New Testament manuscript evidence, and its implications, here are a few points to keep in mind. ● A manuscript of part of the New Testament is not the same as a manuscript of the entire New Testament. 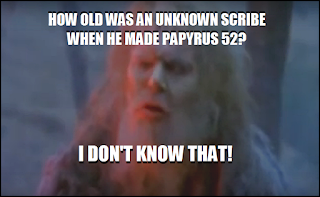 For example, the earliest New Testament manuscript is probably either Papyrus 52 or Papyrus 104 – but they are both small fragments. They tell us nothing about the accuracy of the transmission of the books of the New Testament that they do not represent. So, comparisons between “the New Testament” collectively, and single compositions from the ancient world, are sort of unfair; it would be better to separate the individual New Testament books, and go from there when making comparisons. ● The vast majority of Greek manuscripts supports the Byzantine Text. Generally, 85% of the existing Greek manuscripts of the New Testament agree at any given point. If we were to compile a Greek text by adopting the reading with the most support, the resultant compilation would be very stable, and even where a measure of instability would still exist (in some cases where there are three or more rival variants) the options tend to yield trivial differences in their meaning. The 2005 Robinson-Pierpont Byzantine Textform is such a compilation. ● Most English translations of the New Testament are based on minority-texts at points where the Byzantine and Alexandrian text-types disagree with one another. The New International Version, the English Standard Version, the New Living Translation, and the New Revised Standard Version are all based primarily on editions of the Nestle-Aland compilation, which, despite being compiled via a method called “reasoned eclecticism,” almost always rejects the majority-reading (that is, the Byzantine reading) in favor of the reading in the flagship manuscripts of the Alexandrian family of manuscripts. Let me take a moment to zoom in on this point. The King James Version is sometimes criticized because in a few passages, its base-text (the Textus Receptus) has little or no Greek manuscript support. However, it is no exaggeration to say that if one were to select 20 places at random in the Gospels, where the KJV and NIV are based on different Greek readings that have an impact on translation, we would find that in 9 out of 10 cases, the reading in the Textus Receptus is supported by at least 85% of the Greek manuscripts. At some points that percentage rises above 99%. Promoters of the NIV, ESV, etc., have frequently pointed out that during the centuries after the King James Version was made in 1611, many more manuscripts have been discovered. What they tend not to say, though, is that most of those manuscripts contain the Byzantine Text, and thus agree with the KJV’s base-text much more than they agree with the compilation(s) upon which the NIV, ESV, etc., are based. My point being that it is inconsistent to argue for the reliability of the New Testament by an appeal to the existence of 5,843 manuscripts, and then turn around and reject 85% of those manuscripts by consistently favoring minority-readings, which is precisely what one does when using the NIV, ESV, NLT, etc. ● The compilers of the New Testament base-text of the NIV, ESV, etc., consistently rejected the Byzantine Text, favoring the Alexandrian Text instead – especially when it is supported by Codex Vaticanus. The case for the Alexandrian Text was set forth in 1881 by F. J. A. Hort – not on the basis of the greater number of the Alexandrian manuscripts (because then, like now, they formed only a small minority), and not because of the greater age of Codex Vaticanus (because Hort granted that manuscripts with an essentially Byzantine Text were circulating at the same time Codex Vaticanus was made), but on the basis of cumulative evidence drawn from the intrinsic qualities of rival readings. Much more could be said about this, but the thing to see today is that ever since 1881, a working premise of New Testament textual criticism as practiced by the compilers of the Nestle-Aland Novum Testamentum Graece has been that if one variant is supported by a thousand manuscripts, and another variant is supported by ten manuscripts, the variant supported by ten manuscripts is probably original if Codex Vaticanus is among those ten. with text from the New Testament. ● The relatively recent claim that the New Testament’s manuscript-support is closer to its composition-date than any other literary work of ancient times is probably not true. 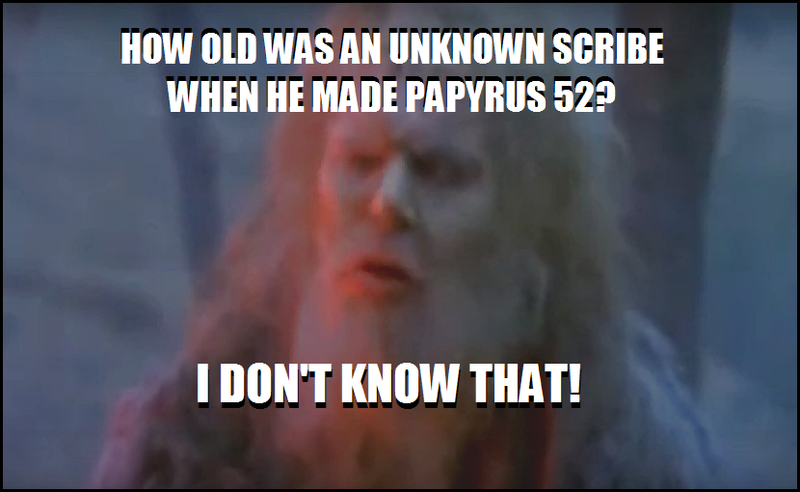 When Papyrus 52 (also known as John Rylands Greek Papyrus 457) was identified by C. H. Roberts as a fragment of the Gospel of John, some apologists began crowing about how this new discovery confirms that there is only a 40-year gap between the production of the New Testament, and its earliest extant manuscript – a gap far less than there is for any other work of ancient times. However, this is not all that significant. 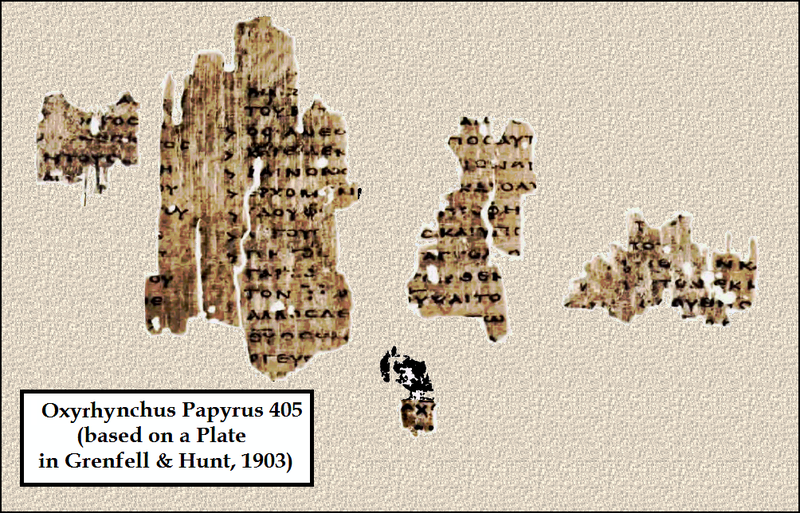 Meanwhile, consider Oxyrhynchus Papyrus 412, which consists of a fragment from the composition Kestoi, by the Christian author Julius Africanus. Julius Africanus died in 240, and probably wrote Kestoi after 221. This fragment was a scroll – and in its present condition, while it has part of Kestoi on one side, the other side has a cursive text that includes its own composition-date, approximately: in the reign of the Emperor Tacitus, who ruled in 275-276. This means that in 275-276, someone recycled pages from a copy of Kestoi – a composition which had only been composed about 50 years earlier. In 1903 when this text was first published in the Oxyrhynchus Papyri Series, Volume 3, Grenfell and Hunt affirmed that “it is separated by little more than a generation at most” from the time when African wrote it. 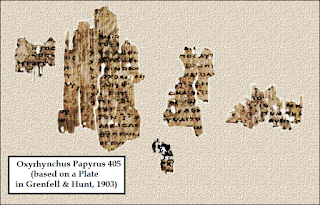 They also observed that despite its close chronological proximity to the autograph of Kestoi, Oxyrhynchus Papyri 412, “The text is far from being a good one; several lines of the incantation especially are corrupt, and one of them is incomplete.” (Similarly, in Papyrus 52, the copyist seems to have skipped two words in John 18:37, εις τουτο (“for this”). This illustrates a point that should be taught and retaught: neither the quantities of manuscripts that favor one variant over its rivals, nor the age of the attestation of readings, should be considered a sufficient and decisive factor by itself when comparing textual variants. So, we have a copy of at least one ancient composition (Julius Africanus’Kestoi –) that is extant in a copy extremely close to the composition’s production-date – probably closer than Papyrus 52 is to the production-date of the Gospel of John. And this is not the only such case: Oxyrhynchus Papyrus 405 (published in the same 1903 volume of Grenfell and Hunt’s series) was not initially recognized by Grenfell and Hunt, who stated that its uncial script “is not later than the first half of the third century, and might be as old as the latter part of the second.” Before the year was over, though, J. Armitage Robinson had not only identified it as a fragment of the Greek text of Irenaeus’ composition Against Heresies, Book Three – to be precise, 3:9:2-3, a passage in which Irenaeus quotes Matthew 3:16-17 – but he also had his findings published in the journal Athenaeum (on page 548 of the October 24, 1903 issue). Notably, the text of Matthew 3:17 as cited in Oxyrhynchus Papyrus 405 does not say Ουτός ἐστιν (“This is” My beloved Son) but, instead, Σὺ ει (“You are” My beloved Son). One could, perhaps use this as evidence that the earliest manuscript of Matthew 3:17 disagrees with the majority of manuscripts and with the Alexandrian manuscripts, in favor of the Western text attested in Codex Bezae (although it agrees with the Byzantine and Alexandrian manuscripts, disagreeing with Codex Bezae, where it does not have Codex D’s phrase πρὸς αυτόν (“to Him”)). Via a consideration of these points I hope that readers may see that it is an oversimplification to treat either the quantities of manuscripts, or the ages of specific manuscripts, as if that is automatic vindication of either a particular reading, or a particular collection of readings. Where our 5,843 Greek manuscripts concur regarding the meaning of a particular passage, there is no scientific impetus to seek some other sense, except in very rare cases where conjectural emendation may be considered (and even then, I would decline to put any conjectural emendation into the text – unlike the current editors of the Nestle-Aland compilation). That is about all that should be extrapolated from the existence of that multitude of manuscripts. I appreciated reading your explanation. There's a lot to be gleaned here. "Where our 5,843 Greek manuscripts concur"--except that they never do. At the very most, less than 1700 manuscripts (in the gospels) down to 350 manuscripts (in Revelation) exist for any given reading. So among any number of manuscripts of any given book there is huge amount of agreement between manuscripts. Even so, we're doing a lot better for any book of the NT when compared to Aristotle's _Politics_, the earliest manuscript of which is a Latin one dating from about 1200 A.D., which may well have been translated from Arabic (and there's a chance the Arabic was translated from Syriac). What is clear from the information on the Rylands Papyri is that we have evidence of the NT being copied and circulated from less than a century after its composition, which is about as good as you can hope for with any ancient literature. Point granted; perhaps it would be better to say, "Where there is no disagreement in the meaning of what is written in any particular passage in our 5,843 Greek manuscripts, there is no scientific impetus to seek some other meaning," etc. Thanks for writing about this, James. I've often thought about this very issue. Often in apologetics works you hear that 5000+ number of manuscripts mentioned. Yes, that is a rich body of mss evidence, but the way this is often delivered leads the average person to think--as you point out--that all these documents are complete. On the other hand, it's not easy to explain to the person who is not versed in textual criticism, even at an introductory level. Nice work making these important distinctions. You have good discernment in this topic. Thanks for sharing and bringing this to light. "the Gospel of John itself is traditionally given a production-date around AD 90"
Plus the various eyewitness claims would be similarly flimsy nothings, interviews with a couple of octogenarians. Plus the New Testament dating chronologies of individuals like John or Luke would be virtually impossible. Why would people close to events in 30-33 AD wait 60 years to publish a Gospel? This type of late dating is simply the result of the German higher criticism of the 1800s. SideNote: the James Snapp Mark ending theories depend on late dating. 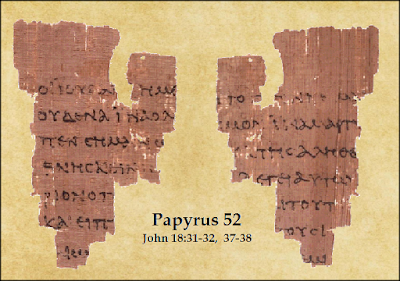 "any serious consideration of the window of possible dates for P52 must include dates in the later second and early third centuries"
There has been an ongoing shell game about New Testament papyri dating. Palaeography is not time-symmetrical. It can be quite good on a terminus post quem (nobody can write in a future style) but without specific external corroboration (e.g. this mummy mask was made in 125 AD, this grocery list was from from 150 AD) the terminus ad quem dates have been myopic and logically fallacious. Including, or especially when used for Daniel Wallace and Lee Strobel style textual apologetics. Avery: "This [c. 90 date for production of the Gospel of John] is traditionally an unbeliever and liberal dating." Said the person who thinks that the Gospel of Luke should be given a date in the 40's. Avery: "This type of late dating is simply the result of the German higher criticism of the 1800s." No, it is not. I decline to even attempt to address the question here. Those familiar with F. C. Baur’s ideas will recognize the difference between your claim, and reality. In the meantime see http://www.crivoice.org/biblestudy/bbjohn1.html . And that’s that about that. Some aspects of Nongbri’s case are stronger than others, and I think he overestimates the later range of possibility for P52. But I would grant that there is enough wiggle-room, at least, that it is possible that P104 may be the earliest NT manuscript, rather than P52.